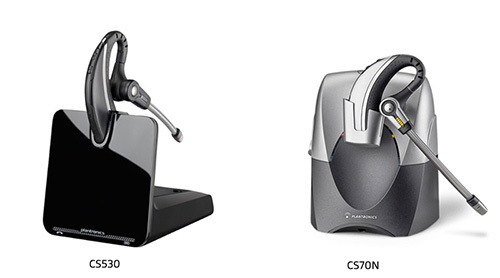 In May of 2011, Plantronics launched the new CS500 Series of wireless office headsets. The CS500 series offers upgrades to its predecessor (the CS Series) in both design and functionality. The CS530 replaces the popular CS70N. The CS530 is available as a single headset system or bundled with the HL10 lifter. Limited quantities of CS70Nare available. Wireless, Over the Ear, Monaural Office Headset with Remote call control (EHS Cable or HL10 Lifter required). Connects to Deskphone. Wireless, Over the Ear, Monaural Office Headset with Remote Call Control. Connects to Deskphone. CS70N has been discontinued; limited stock still available. Read more about the CS70N replacement: CS530.